On Design Santa Barbara we welcome some of the most talented interior design students from Santa Barbara City College. In the SBCC Interior design program they focuses on the creation of interior environments that are both functional and pleasing. Offering a variety of employment opportunities with interior design and architectural firms, kitchen and bath design studios, as well as with interior materials and furniture stores. A combination of education, work experience and passing the National Council for Interior Design Qualification. For the past 5 seasons professor Laura Wilby has brought some of her finest students to Santa Barbara Design Center to show case their skills on Design Santa Barbara. This helped them utilize a wide variety of items to work with. Furthermore, creating outstanding vignettes. Liz Corsi was born and raised in the San Francisco Bay Area. Growing up in a metropolitan area gave her a multi-faceted outlook on art, architecture and business. Liz was surrounded by creative industries which aided to her interior aesthetic. She starts with a beautiful Modern hand spun wool and silk rug as the foundation of the room. furniture she chose goes well together for a very beachy feel. In addition, the Susan Sectional is custom made to your specification, this sectional features washed California chalk fabric with angel hair wrap fill for medium comfort. Susan Sectional brings a beachy look for any home with its loose pillows. Also Included in this design is the Farley Coffee Table. This coffee table has art deco inspired design with a rectangular tabletop made from gray vellum. Featuring unique metal base with a finish to compliment the overall style of this inspired coffee table. Followed by Garden Armchairs hand crafted of solid birch in the Chippendale’s versatile Chinoiserie style. With back’s handsome faux bamboo frame and lattice frets finish in an octagonal top and straight bottom. Other great details include faux bamboo tapered legs and x-base decorative stretchers. The Cameron console table used to match the back height of the sectional. So bring some light into the room Liz incorporated the Palais Table Lamp with a mother of pearl finish for that beachy feel. Followed with accessories to make the room feel like home. In this space Liz gives some pointers on how to go about illuminating a dead space. Incorporating a tall tree to bring the outdoors in and a large mirror to make the space look bigger. Elise Greganti was born and raised here in our very own Santa Barbara. She became inspired to do interior design because of her film background. Her dream was to design sets for the camera. Elise became fond of designing spaces with a strong theme, and creating a vivid experience. Greganti’s goal is to continue on to four years of college, hopefully Pratt in New York City. As well as, getting her bachelors in interior design and start in the art department, assisting on set with design for the camera. Although she find herself able to do many different styles of design, she is drawn to doing more masculine designs with dark colors and strong lines. On Design Santa Barbara Elise Greganti chose to do a old fashion office vignette that her client Robert an anthology. Who wanted a warm cozy space to do work from home and be able to have visitors feel comfortable. One of her main pieces was the Antique Oak Library. Featuring a glass display case hand made from Spain. second most important piece is the Antique Spanish Oak desk that fits very well with the antique display case. Due to the dark wood and antique hand carved design. To go with the desk is a comfortable Office chair. Elise incorporated a tradition Farahan Rug to match the traditional room setting with its red tones it brought the room together and all the colors. Along with beautiful comfortable leather chairs from Santa Barbara Design Center. The room together with an Virtuso Chest as a coffee table. As well as, some accessories to make it feel more like home. Robert Mitchell is a new student to the field of architecture but has his mind set on learning all that there is to know about design. He is still exploring the many styles that appear in the history of architecture. but he believes he has found his passion in traditional and formal residential projects. Robert Designed this Vignette on Design Santa Barbara for a client. Who has a family that has decided to turn a spare room in his house into a den. For a evening of poker and solitude. The first item to catch your eye is the wonderful Declaration Of Independence frame. Furthermore you always want to start from the ground up. 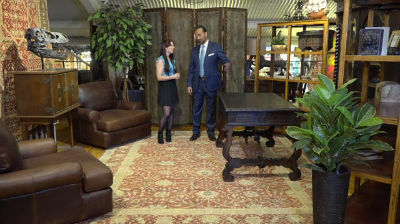 In this case Robert picks out a beautiful Indo Mughal rug that is rich in color to bring the room together. Included is also a dry bar with storage space to store alcohol because a poker room isn’t complete with out one.